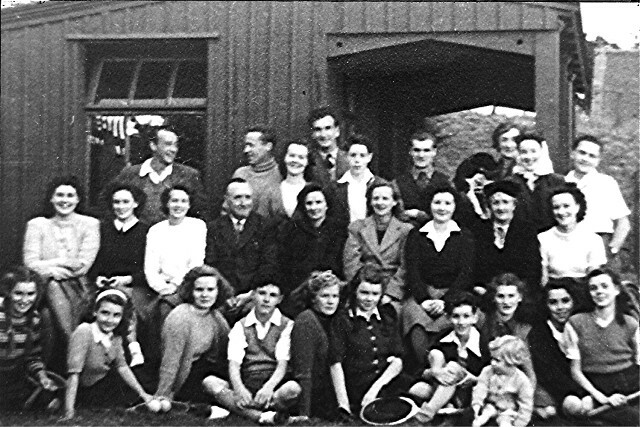 Invergordon Tennis Club - 1940s. The small child at the front is Mrs. Oag. Centre row: Nita Munro, ?, ?, ?, Mrs Macfarlane, her sister, Wilma Grant, ?, ? Hullo Jessie, next to Nita Munro is Netta Macwilliams, 2nd. right, same row is Mrs. Austin. 1st. right, bottom row is Sheena Mackintosh and next to her is June Gordon. Is that Mrs. Auchterlonie 4th from right middle row? Is that ?? Maclennan 4th right bottom, and Katherine Makintosh on his right? More thoughts!! Next to June Gordon is, I think, Sheila Bissett (Bisset's Hotel) and then, again I think, Sandy Sinclair (not Maclennan). However I could be having a "senior moment" and getting it all wrong! Rosalie, Hi, you mentioned that 4th right could be ?? Maclennan. I am wondering if you mean Cameron Maclennan, my Dad. I know he was friendly with Sheena, June & Katherine when they were teenagers, but I have never seen a photo of him around this age so I can't be sure. I will have to ask my sisters to have a look and check it out. Sadly, Dad passed away 5 years ago. He had an abundance of Auburn hair when he was young and worked for the Post Office for over 40 years. Hi Jackie, I knew your Dad so I don't think this is him. However I think the lad in question is Sandy Sinclair who I think is either related to your family or the Mackintosh girls. I'm sure someone will let us know. Jim Maclennan (I think related to you) was my piano teacher. Hi Rosalie, yes I believe it is Sandy Sinclair. My sister showed the picture to our uncle Bill and he confirmed that it was Sandy. Mum said that he lived with the McIntosh's. Jim was my Dads uncle, He had a band during the war I believe I think his brother Allan was in it too. I wonder if anyone knows anymore about that. He lived at Alexandra House on the High Street until he was in his 70s. We lived across the street at no 15 when I was little. Front Row: ? , Shirley Mackenzie, Anne Gammie, Bobby Logan, Rosa Mackenzie, Jennifer Logan, Sandy Sinclair, Sheila Bissett, June gordon, Sheena Mackintosh. Just come across this photo. l was friendly with lots of these people during my time in Invergordon. The first was Sheila Bisset at her parents hotel.